Several of the guided missiles now in use by the Navy are discussed briefly in the following paragraphs. Sparrow III The AIM-7F Sparrow III guided missile (fig. 8-11) is a medium-range, all weather, supersonic, air-to-air missile. It is designed to be rail or ejection launched from an interceptor aircraft. The tactical mission of the missile is to intercept and destroy enemy aircraft in all weather environments. It is launched from the F-14 Tomcat and F/A-18 Hornet aircraft. Excluding the radome, the missile body is made of four sectional tubular shells that house the four major functional components. The four major functional components are the target seeker, flight control, warhead, and rocket motor. The missile is 12 feet (142 inches) long, 8 inches in diameter, and weighs 510 pounds. 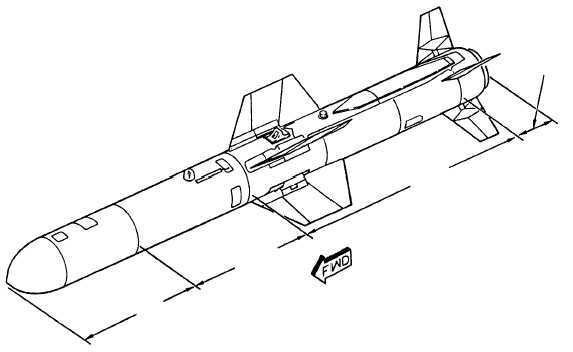 Harpoon The AGM-84A-1 Harpoon surface-attack guided missile (fig. 8-12) is an all-weather, air-launch, antiship attack weapon. It is launched from the P-3 Orion and S-3 Viking aircraft. The missile consists of the guidance section, warhead section, sustainer section, and boat-tail section. It also contains wings and control fins. 8-14 RADOME TARGET SEEKER FLIGHT CONTROL ROCKET MOTOR WAVEGUIDE (FORWARD SECTION) WIRING HARNESS WARHEAD FORWARD FIN (4) AFT FIN (4) WAVEGUIDE (AFT SECTION) ANF0811 Figure 8-11.AIM-7F Sparrow III guided missile. GUIDANCE SECTION WARHEAD SECTION/INERT WARHEAD SECTION SUSTAINER SECTION CONTROL SECTION ANF0812 Figure 8-12.AGM-84A-1 Harpoon guided missile.